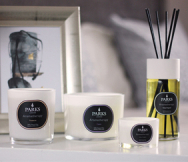 Parks Candles’ Moods by Parks collection features many unique perfume blends, which are intended to evoke a certain mood in the user or foster an environment that is more conducive to certain emotions. Therefore, you will know what to expect from a combination called ‘Calm’. This scent is, for lack of a better word, calming. We feel that it is perfect to cool frazzled emotions, centre you in the face of adversity, or to seek the perspective we all need to manage change wisely. Chamomile is a lovely scent that evokes the calm that we feel when drinking that gentle herbal tea. The scent itself is associated with calm and relaxation in many people’s minds, and it forms one of the key notes to this perfume symphony. Tuberose is not only the flower that traditional Hawaiian leis are made from, it is also a night-blooming flower with hints of coconut, spice, and just a hint of musk. Cedarwood is a rich, earthy smell that symbolically, at least, gives the tree a sense of being rooted and immovable. It also smells wonderful as part of this blend. Patchouli is already a familiar scent to many of us, but its rich fruity tones successfully bind the rest together into a smooth whole, ensuring there are no ‘sharp edges that might spoil the mood. This reed diffuser kit comes complete with everything that is needed to spread calm and peacefulness throughout any home or office for three months or more. The kit includes a decorative perfume container, an open-topped reed diffuser lid and, of course, a diffuser that distributes the scent evenly and cleanly.